To get started quickly on Teams, we recommend you create two or three teams and channels for a select group of early adopters. By first rolling out Teams on a small scale, you'll learn Teams by using Teams and gain valuable insights to inform how you deploy Teams across your whole organization. If you're a small business, this Quick start guide is all you need to roll out Teams to your whole organization. Teams lets you quickly pull together a team with people inside and outside your organization, chat with others to drive fast and inclusive conversations, securely share and coauthor documents, and iterate on projects. Customize Teams by adding fingertip access to shared notes, webpages, and apps. Use meetings and calling to collaborate in real time from wherever users are. 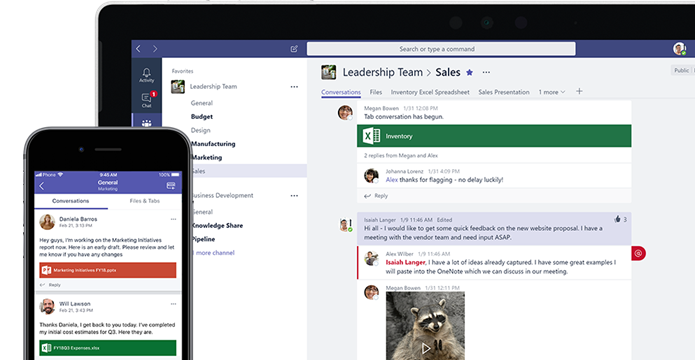 Teams will simplify your access to Office 365 services and third-party apps to be the new center of gravity for your collaboration and communication needs. Encourage your early adopters to install both the desktop and mobile applications for the best experience and most accurate feedback. Here's how to roll out your first set of teams and channels so your early adopters can start chatting, sharing files, and collaborating. If you're a large organization, have a hybrid or on-premises Skype for Business configuration, have strict regulatory or compliance requirements, or if you want to roll out meetings or voice features (such as calling plans or phone system), start by reading How to roll out Teams. We recommend you still begin with this Get started section to build your skills and start planning your org-wide deployment. "Plan Teams with Teams." Start small by rolling out Teams with chat, teams, channels, & apps and build from there. These initial experiences will help you spread the word about Teams, generating excitement throughout the organization for your next launch phase. If you're a small business, you may be able to use this Get started guidance to fully roll out Teams in your organization. Small businesses might not need to do a phased Teams deployment. Make sure you’ve got Teams licenses for everybody. Check out Compare Teams plans and Office 365 licensing for Teams. Go to Create your first teams and channels. Learn more with our interactive Teams Adoption Guide.